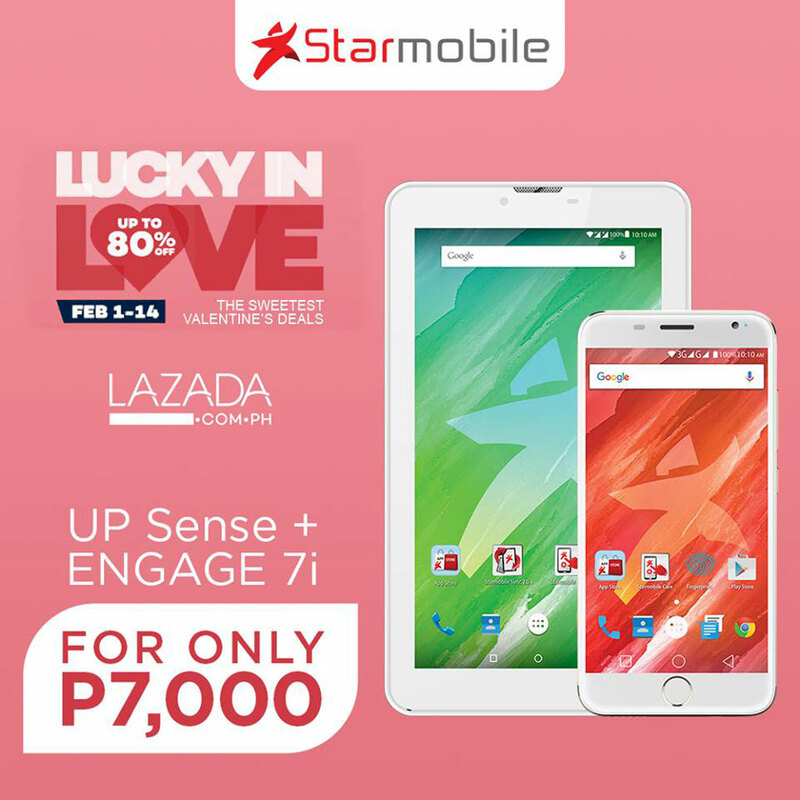 Sale Alert: Starmobile Smartphone + Tablet Valentines Bundle for as low as Php7,000! 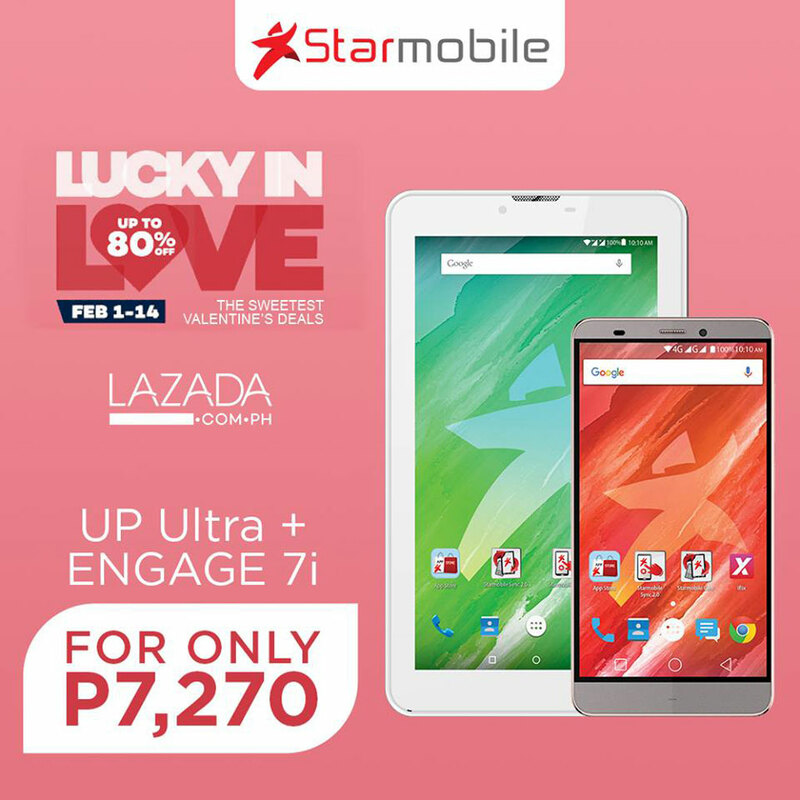 Just in time for the Valentine's Day, Starmobile is having a very attractive sale on its popular smartphones and tablet in Lazada. The exciting bundles sale will last until February 14, 2017 that will include the best-selling ENGAGE 7i tablet with either UP Ultra or UP Sense smartphone. Below is a quick guide to help you decide which of these is your OTP (one true pair), depending on what you’re looking for in your tech relationship. Combining the functionality of a dual-SIM mobile phone with the screen size and utility of a tablet, the Starmobile ENGAGE 7i is a 7-inch powerhouse running on Android 5.1 Lollipop. The tablet comes with a large 3,000mAh battery that’s capable of up to 20 days standby time or up to 10 hours of talk time. It is bundled with a Smart Bro SUPER PACK with free 200MB/month for surfing and other apps, equivalent to Php 2,400 worth of free data valid for 6 months. Meanwhile, the Starmobile UP Ultra is a 5.5-inch 4G LTE Android smartphone considered to be one of the company’s most value-packed mid-range offerings. The UP Ultra is bundled with over Php 4,000 of free LTE data services from Smart valid for 12 months, plus 6 months of free access to popular streaming site iFlix (700mb/month with an accumulated top-up of P150/month.) With Smart having the widest 4G LTE coverage in the country, users can enjoy seamless multimedia streaming on UP Ultra’s clean and crisp HD screen. With this bundle, the ENGAGE 7i call-and-text tablet comes with the gorgeous UP Sense. This smartphone lets you use the most secure tool that you have in your possession 24/7 to lock your device and control access to your apps and private files—your very own fingerprint. It also has a sleek curved HD screen – a feature usually found in more expensive smartphones – designed with in-plane switching (IPS) that enables crisp and clear viewing of photos, videos, and websites. You buy here now. You can learn more about these devices by visiting www.starmobile.com.ph or by logging on to facebook.com/starmobilephones, then head over to Lazada.com.ph to get yourself any of these special bundles. Use them wisely and they may just bring you even closer to your Valentine this February.